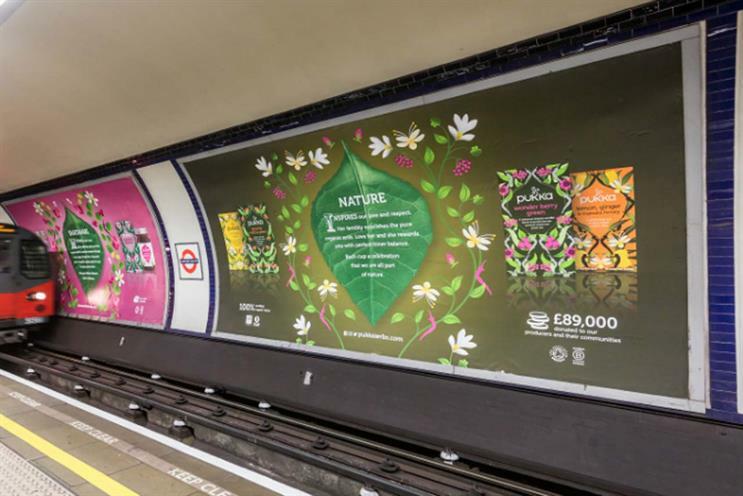 Pukka Herbs, the tea and infusions brand owned by Unilever, has appointed Gravity Road as a creative and strategic partner. The appointment comes after a review process in which the brand met a number of global creative shops. It is the first time Pukka has formally appointed an agency, with its previous advertising created either in-house and by design agency The Space Creative. In 2017, Pukka became the first brand to use an enhanced data segmentation offering from Hello London, the media partnership between Exterion Media and Transport for London, allowing the brand to select London Underground stations most used by its target consumers. Neil Fox, marketing director at Pukka, said: "The intention with Pukka has always been to reach as many people as possible with the incredible power of organic plants, ethically and sustainably sourced from around the world. "This commitment grows with greater purpose and ambition every year. Across the globe, we look forward to welcoming those who do and don’t know about Pukka on a journey of discovery into the world of organic herbs and all the benefits they bring." Sarah Ellis, managing director at Gravity Road, which is owned by You & Mr Jones, said the agency was excited to be working with "such a progressive and relevant brand", adding: "And, personally, I’m delighted to work with a brand whose DNA has been built with a strong social mission." Founded in 2001, Pukka was acquired by Unilever in 2017.